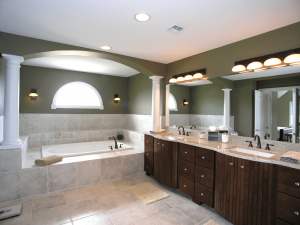 Are you thinking about making over your bathroom? If so, lighting is a great place to start. Here are some simple tips on lighting your 2017 bathroom. We hope this information will help you determine what type of lighting you would like to use. Where to use it. And most importantly why? Lighting can make a big difference in you bathroom environment. It can help illuminate the specific tasks while offering warmth and comfort. The marketplace is awash with new lighting ideas and devices for the washroom, but there are certain things you should know that can help you during your design process. Lighting can be placed into 3 distinct categories – Task Lighting, Ambient Lighting and Accent/Layered Lighting. Below you will find a definition and sample us of each. The Remodeling Pro would love to walk you through these options but we can also offer checkout Houzz, Pinterest or HGTV to find some ideas. Once you decided we can help you install them. Task lighting is simple to explain – this is lighting designed to help you with a specific task like grooming, makeup, hair dressing and even reading. It is usually (direct) directional in nature, and offers cross illumination. A sample of task lighting would be lighting the vanity area. When lighting the vanity one must consider the actions that will be taken in this spot. The vanity is usually topped by a mirror lighting will be important. Since the vanity is typically the location you will shave, or place makeup on your lighting must be designed to around that task. In order to remove shadows on the face, eyes, cheeks and chins task lighting using flanking vertical mirrors is a standard choice. Fixtures on opposite sides of the mirror pointed directly at the face will illuminate the face. This cross illumination is the key to lighting you task properly. 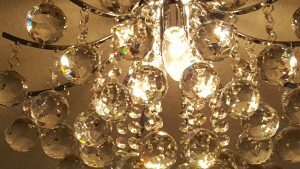 What is ambient lighting? It is in a sense, “fill-in” or natural lighting. In many ways ambient lighting is the opposite of task lighting. It is indirect and can add a warmth to the bathroom rather than illuminate a bathroom. Ambient lighting can come from all kinds of sources including windows, sky-lighting, lighting sconces, cove lighting, recessed lighting and surface mounted lighting. A sample use in bathroom of ambient lighting would be to light the entire bathroom or over the tub or toilet area. The design of ambient lighting will differ in rooms that already receive natural lighting from windows and skylights. 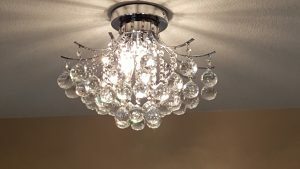 Accent lighting is designed to illuminate areas of interest – plants, art pieces, ceilings, glass, or even unique fixtures. 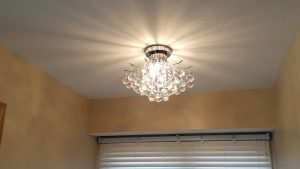 Accent lighting may include chandeliers, pendants, pots, spots and more. It can include a mixture or crisp white and daylight soft bulbs. The use of dimmers can be very effective for accent lighting for highlighting and mood enhancement. A sample use in a powder room might be highlighting of the ceiling, plants, or artwork. Finally a properly layered bathroom lighting will be a combination all off the above. Layered is ambient lighting, highlighted by accent lighting and task lighting providing a warm naturally lit space with specific combinations of illumination, mood, and enough lighting for tasks. Lighting can be a big part of your bathroom makeover. This beautiful lighting fixture came was place in the bathroom above the bathtub. It modified the mood and look of the space. And the Porters loved it.